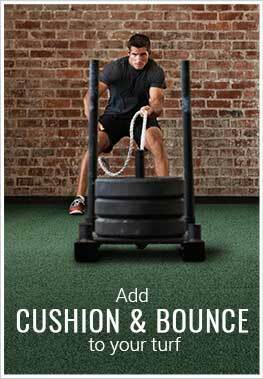 Description - Elevate your gym to the next level with our Elevate Premium Turf Rolls. This cleat friendly indoor turf is the perfect option for any CrossFit or multipurpose gym and can withstand the daily abuse of any athletic activity. This fake grass comes with or without foam padding. The foam padding adds comfort underfloor for high impact workouts and floor exercises and also provides your turf with added stability which is needed when doing exercises and sports with lots of cuts. Easy to install, clean, and maintain, a 10-year warranty backs this turf. Material – Polypropylene/Nylon fiber with a urethane unitary backing or a urethane foam backing. Face Weight – 68 oz. Weight – The urethane backing weighs .8 Lbs. per sqft. and the urethane backing with foam weighs 1.65 Lbs. per sqft. Recommended Uses – Our Elevate Premium Turf Rolls are perfect for any indoor gym facility and have been used as flooring in CrossFit gyms, multipurpose gyms, as turf for indoor soccer fields, as indoor football practice field turf, and much more.